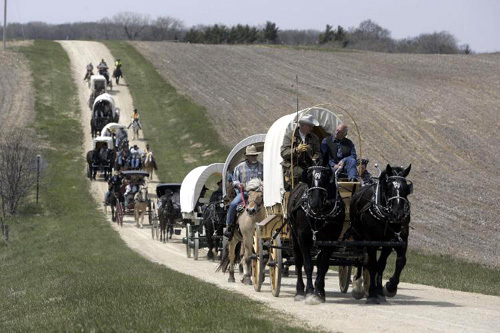 The first weekend of May, Minnesota began the kickoff celebration of their historic past with the Sesquicentennial Wagon Train. In all, about 85 people, on horseback and in covered wagons, buggies, surreys and one stagecoach are taking a week long, 100 mile journey, which will end Sunday at the State Capitol. The arrival of the Sesquicentennial Wagon Train at the State Capitol is the linchpin for the kickoff for the state’s 150th birthday celebration. The travelers started with two stuck wheels, a willful mule, a handful of skittish horses and a thrown rider. That was all before noon. A “green” horse three times took his driver off-road. A mule seeking his pasturemate took off, throwing his rider in the tall ditch grass. Among the group were Pete Karpe who came from his farm in St. Francis, bringing his Percheron draft horses Trixie and Dixie, as well as his son, Mark, a capable, horse-mad 14-year-old. Susan Longling, of Farmington, a confessed wagon-train addict, brought her Prince to pull the surrey she’d converted from her grandfather’s dairy (and bootleg liquor) cart. As a strong sun broke through the crisp morning air, wagon master Jon Olson shouted, “Wagons, ho!” and the caravan rattled across the fairgrounds, onto the road. Karpe had some trouble at the start, when the rig he drove became stuck in the mud. 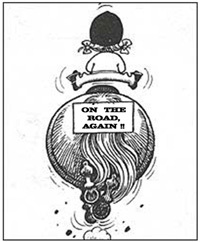 But once on the road, Dixie and Trixie easily caught pace with the group, their shod hooves ringing on the asphalt. This was “Americana” at its best! The caravan continued, past bare fields and stands of cedar and elm. 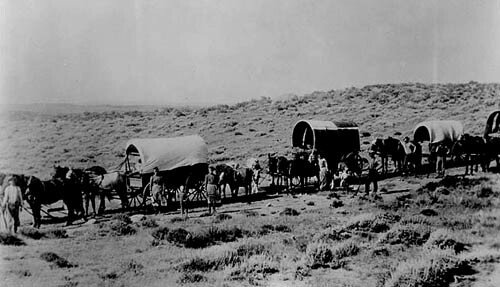 The covered wagon is an icon of the American frontier. Still, in the 1850s, most arrived by water, via Mississippi steamboat. 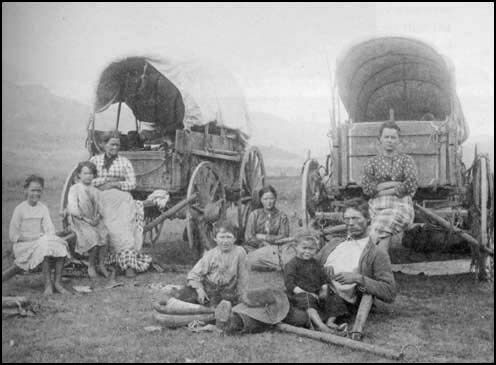 From there, with the Big Woods of Wisconsin and the Mississippi behind them, settlers fanned out, often in wagons, all over the state. The covered wagon was like the 19th century sport-utility vehicle, said Matt Anderson, a curator for the Minnesota Historical Society who specializes in transportation artifacts. And contrary to the archetype, wagons weren’t meant for people. Usually, they were packed with luggage or cargo. 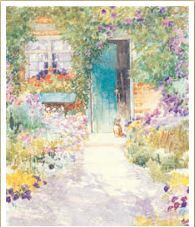 “Anybody who could walk, I’m sure did,” Anderson said. Although the rigs at camp are more or less authentic, it’s hard to ignore some of the comforts of today: coolers, lawn chairs, RVs, digital cameras and the occasional chiming cell phone.